Buying a timeshare at Villa del Palmar can be a great opportunity, especially if you like to take regular vacations and love Mexico. When you purchase a Villa del Palmar timeshare, you are guaranteed some of the best vacation accommodations in Mexico’s top destinations. Villa del Palmar Beach Resorts & Spa are a venture by timeshare masters, The Villa Group Timeshare who boast 30 years promoting timeshare and developing resorts in Mexico. The Villa Group are one of the reputable timeshare companies operating in the popular vacations destination in Mexico such as Puerto Vallarta (and Nuevo Vallarta), Cancun, Cabo San Lucas and Loreto. When you invest in a lifestyle choice such as timeshare, you can be sure that Villa Group will deliver excellent quality, good taste and value for money. 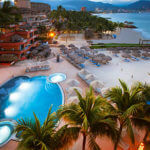 The locations where Villa Group Timeshare have Villa del Palmar resorts are the top vacation destinations in Mexico. Each resort has been especially located so that guests and timeshare owners can reach the downtown areas easily as well as direct beach access. All of the Villa de Palmar resorts in their respective locations are 40 minutes or less from an international airport with routes to most major cities in the USA and Canada. The Villa del Palmar timeshare resorts are all different yet have key elements in common. For example, the pools are a central part of the resorts’ design with lush landscaped gardens and sandy beach access. You will also find that there is a world class spa located on the grounds of a Villa del Palmar resort with all sorts of spa and beauty services including wraps, massages, manicure etc. The restaurants at Villa del Palmar resorts are also frequently commended in customer reviews, and all inclusive packages are available in each of the locations. Timeshare owners can opt into all inclusive passes for as little as three days or the entire stay. The Villa del Palmar timeshare accommodations are spacious, even at entry level studios. One bedroom suites and bigger have fully equipped kitchens and large living areas, making the apartments like second homes. You can also enjoy all the services of a hotel, such as room service, a maid and even have a private chef prepare a meal in your unit. You get the best of both worlds as a timeshare owner at Villa del Palmar. When you buy a timeshare at Villa del Palmar you will also be invited to join Villa Preferred Access, which allows you to gain even more flexibility from your timeshare. Villa Preferred Access means you can swap your timeshare week for points. These points are then exchangeable for other Villa Group Timeshare resorts in destinations other than where you first purchased your timeshare at Villa del Palmar . Share the post "Review: Timeshare at Villa del Palmar"